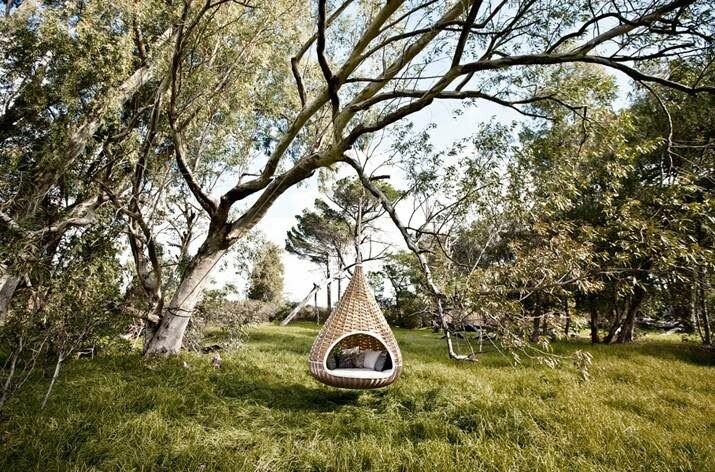 When the weather is nice outside, how sweet would it be to nestle up in one of these Nest Rests designed by Daniel Pouzet and Fred Frety. Talk about design inspired by nature! For some reason I think of the movie Emma when I see these -- anyone else? OOOOOOOOOOOooooo .... okay, I may just have to travel out of state for one!! So elegant, yet whimsical. Of course, the fact that it snows more than half the year here.... may have to put it in my studio! I want one sooo bad. And yes, the background on the last scene with the bent trees and the hazy, moody woods. I could see any one of Jane Austen's heroines here, even Elizabeth Bennet! ;).... "Elizabeth continued her walk alone, crossing field after field at a quick pace, jumping over stiles and springing over puddles with impatient activity, and finding herself at last within view of the house, with weary ancles, dirty stockings, and a face glowing"
Oh my!!! I must have one of these!!! These are just beautiful. I love a good hidey-hole, and I can't imagine anything better than one above a river - although I do admire his bravery/faith in his own knot tying abilities! me thinks this would look splendid under the my christmas tree! I would love one someday, if we're blessed with a house and a yard to hang it in. One question - what do you do with all of those lovely cushions when it rains? Magical! Though I also wonder about the one hanging over the water, except how he got in! Sooo beautiful!! And doesn't the guy in the last picture look like Alex??? So wonderful, these! Going on the Christmas list for sure! 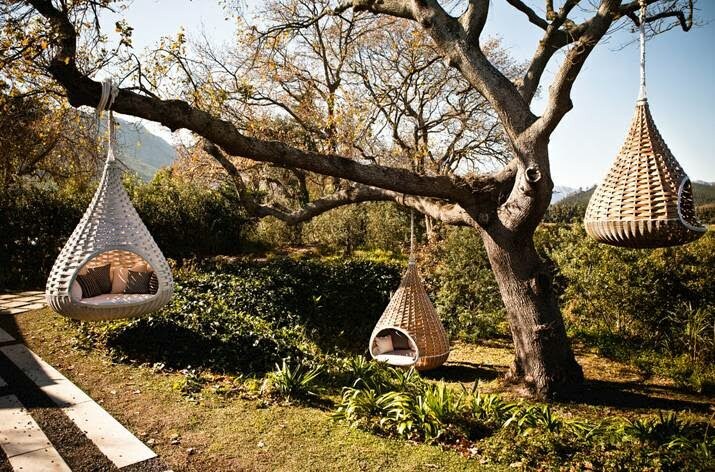 oh my goodness, I NEED to relax in one of these. How on earth did the guy in the last picture get in his with dry feet? Was he hung there after he went inside? Wow this looks really amazing, it's definitely a part of the nature it's placed in... thanks for the inspiration! I should get rid of my bed and get one of those! definitely one of the best place to have a nap!! love it! Rachel, I just have to say that i love your blog, whenever i get the blah's i look at your blog and it makes me happy. I am mac's cousin by the way, i've only met you a couple of times.. just wanted to let you know i'm a fan!! So completely love these! great find..
Wow I completely love this! 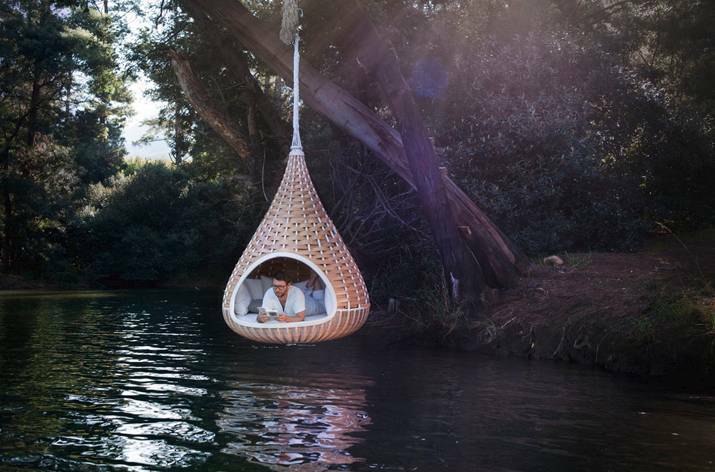 I'd quite like one in my flat as a mini chill-out room to read! Oh this is just bliss. I'd love to have a whole little community of these hovering in a park.. gorgeous..